First off, I’m pretty sure this is the first official Transformers story I’ve read that starts with Victorian poetry, as the first page is a section of Alfred, Lord Tennyson’s In Memoriam. Classy! On the Vis Vitalis, the crew is welcoming those who have come to pay their last respects to the dying Thunderclash. Firestar — one of the new batch of female characters series artist Alex Milne posted recently — leads Countdown to the medbay, where Thunderclash is stuck in a sickly gray-toned vehicle mode. (And I love the details Milne gave Thunderclash’s vehicle mode that make him identifiable while still being distinctly Cybertronian.) Countdown is a pretty big hero himself…which he owes to his time at the Thunderclash School of Heroic Arts. On the Lost Light, Brainstorm, Skids, and Getaway are mercilessly pestering poor Nautica, who just wants to read the psychology book Rung lent her. Brainstorm’s added another new function to Nautica’s wrench: a light that will disrupt the attention deflectors Ravage uses to keep himself hidden. Meanwhile, Ravage is in the bar with Bluestreak and Swerve, the latter of whom has filled the conversational void left by Ratchet’s departure with the entirety of humanity’s creative achievements. But as Brainstorm shows off his new invention and his utter inability to understand monetary value and Swerve holds forth on Dan Harmon’s departure from Community, their charming character moments are interrupted by the sound of a gong. A gong, specifically, with a big flaming Autobot symbol on it. Rodimus has an announcement. 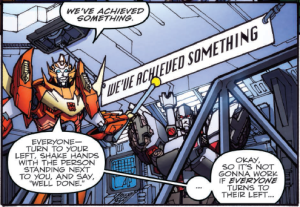 Look, I just cannot get over grumpy Megatron standing under a banner that says WE’VE ACHIEVED SOMETHING while Rodimus is all proud and grinning. That banner. It is perfect. 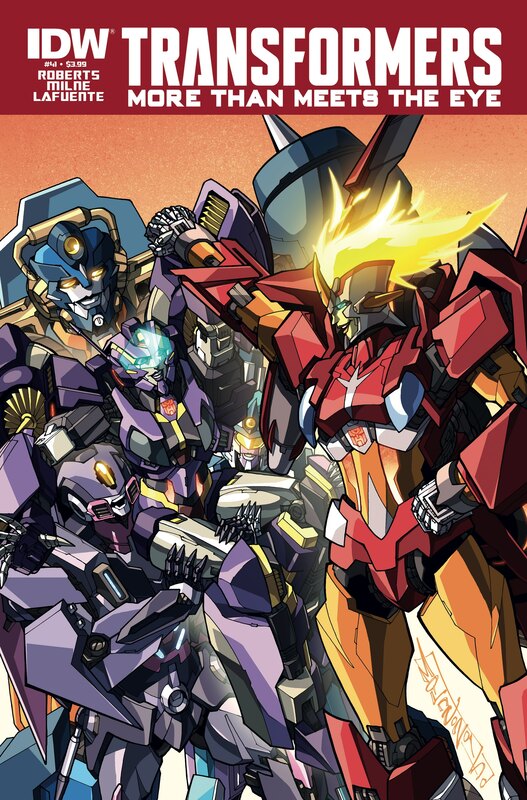 Rodimus gives them a pep talk about looking their best for the pre-wake before totally weaseling his way out of going himself. 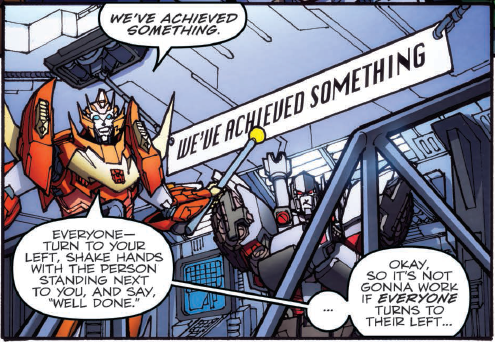 MTMTE Rodimus can be a ridiculous child sometimes, but when it comes to Thunderclash I sympathize with him completely. He and Megatron have a mutual calling-out as Megatron sneers at Rodimus’s claims that he needs to stay on the ship to strategize and Rodimus gets on Megatron’s case for spending all his time sulking in his quarters since that time Rewind tried to erase him from existence. A “pre-wake”, as it turns out, looks a lot like a disco, and the two crews hit the dance floor alongside a bust of Thunderclash stacked with innermost energon vials and the inscription, “About To Be Taken From Us Too Soon”. The usual suspects are dancing the night away, but Rung, Cyclonus, Nautica, and Nightbeat are off being wallflowers. (And Nautica has her face shield down, poor thing!) After Tailgate begs Cyclonus to join him on the dance floor, Nightbeat decides it’s time to do what he does best: snooping. Before Nautica can decide if she wants to join him, she hears a familiar voice calling out an awful nickname: It’s Firestar, coming to greet her old friend! Or show off to her. The awkwardness and discomfort here is almost a physical thing — they feel like the sort of friends who really just had lots of mutual friends but never quite meshed with each other individually. 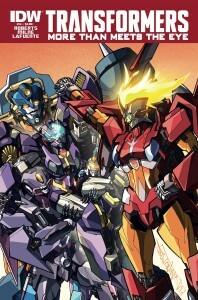 Firestar is showy, someone who has fire for hair (a shame Rodimus is missing that) and interrupts Nautica and dismisses her accomplishments as part of being friendly, whereas Nautica is hiding behind her face shield at a party. But Firestar does tell Nautica that a sizable chunk of their social circle from Caminus ended up on the Vis Vitalis after they answered a distress call. In the medbay, Ultra Magnus — or rather, Minimus Ambus, an identity he seems to be getting much more comfortable with these days — is looking over a wall in which Thunderclash scratched out the visions he’d been having of the map to Cyberutopia before his body gave out. There are some familiar symbols among them, ones we saw back in “Remain in Light”. But as First Aid points out, Thunderclash shouldn’t be dying at all, as some unnamed medic was able to fix his damaged spark a few months before. Nightbeat and Getaway check the morgue for Ravage, thinking he’d go somewhere dark. They don’t find him, but they do find the corpses of some very impressive Autobots — the sort who might have traveled out for the pre-wake of someone as important as Thunderclash — including Countdown’s. He’s only recently deceased, and there’s no sign of what killed him…until Nightbeat turns on Nautica’s new light and sees him covered with some kind of egg-barnacle-things. Egg-barnacle-things which are also on Getaway’s face. And by that light they can see they’re surrounded by horrible alien monsters! I didn’t expect this to turn into a horror story, especially since we knew Thunderclash was dying and there was no reason to assume it was anything unnatural, but I’m all about space horror. Nautica is absolutely precious in this issue, and I like Getaway a lot more when he’s not creeping around Tailgate. I love that female characters are just popping up all over now, and with the main cast accustomed to Nautica there’s no need to draw attention to it. I’m really impressed with the range of designs Milne did for the female V.V. crew. I’d become so resigned to female designs having to be conventionally attractive (apart from the occasional Strika) that I’d forgotten how much I needed big brawny robot women and robot women with weird eyes and totally unremarkable robot women and the whole array of them. I love that this is a thing we can have. But then, that kind of sums up all of it: I love that this is a thing we can have.